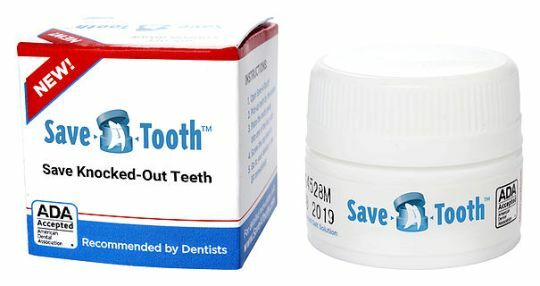 What do you think of this product, Save-A-Tooth? Is it worthwhile? I’ve looked it over, and it looks legitimate–based on sound dental principles. What they have here is a kit that is designed to help keep a tooth alive after it has been knocked out (avulsed). If you have an accident that causes a tooth to be knocked out, if that tooth is replanted within half an hour, the chances are good that it will survive. When this would happen and a patient would call our office, we would tell them to not touch the root but keep the tooth moist and come in immediately and we would put it back for them. Sometimes we were fast enough and we got the replanted tooth to survive just fine. Other times we weren’t and the tooth would heal initially but then become a victim to external resorption and eventually fall out. What they have done with Save-A-Tooth is provide first, a solution that is specifically designed to help keep the tooth ligament alive. It contains a balanced salt solution that is especially gentle to the tissue. It is the condition of this ligament that determines whether or not the tooth will reattach successfully to the jawbone. For example, if the patient were to try to clean off the tooth, that would guarantee failure. They say that the tooth can be kept alive for up to 24 hours. That seems like a stretch to me, but I wouldn’t be surprised to learn that it worked for a couple of hours at least–plenty of time to get to a dentist and get the tooth replanted. Second, the container is designed to carry the tooth gently without any damage to the delicate ligament tissue. All in all, the product seems based on sound dental principles. I feel so sorry for what has happened to you, and yes, there is help available. I am in Arizona, which is a long way from where you live, and I don’t practice anymore, but there are excellent cosmetic dentists all over the country who are willing to do this type of charity work, and they are specifically set up to help women who are victims of domestic violence, to help them get their smiles back. Visit the website of the Give Back a Smile Foundation. They are run by the American Academy of Cosmetic Dentistry. See http://www.aacd.com/index.php?module=cms&page=610. 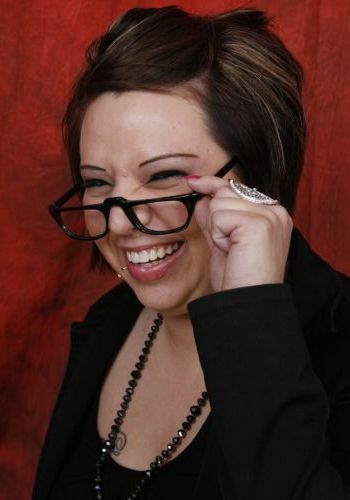 Read more about extreme makeover cosmetic dentistry. I took a nasty fall about a month ago and now all my front teeth and bottom are turning black. I also feel like I have a root sticking up towards the nose area. Do I go to the dentist or a md? And what do they do for this type of injury? Implants or veneers? Any idea on how much this would cost? When your teeth turn black after a traumatic injury, it is probably because you have killed the nerve tissue inside the teeth, and that tissue has died. If that is the case, the teeth will need root canal treatments. There would be a way to bleach the darkened teeth from the inside so that after the root canal treatments you wouldn’t need crowns on those teeth, but a lot of dentists may not know how to do that. You didn’t mention anything about displacing these teeth. Can I assume that they’re all in the correct places? About the root sticking up toward the nose area, I’m not sure exactly what you mean by this. It is possible to surgically re-position the teeth, but that is difficult unless it is done right after the injury, before the bone has healed. The other option is to remove the displaced tooth and place a dental implant. All of this would be under the care of a dentist, particularly a skilled, highly trained cosmetic dentist such as we recommend on our website. As far as costs – root canal treatments on front teeth would be a few hundred dollars apiece. If they required crowns or veneers to cover the black, you can figure on one two two thousand dollars apiece for that. In Arizona, you’ll be on the lower end of that range. It’s also possible that you cracked the roots of these teeth. If that has happened, the teeth may not be savable and will have to be extracted. My 9-year-old daughter broke her front tooth. Last night my daughter who is 9 fell and broke one upper front tooth and put a horizontal crack in the other. We took her to a dentist today and he doesn’t have the time to fix it until March. I want it fixed now and want to go somewhere else. He said the root needs time to desensitize anyway. Is it ok to bring her somewhere sooner or is it usual protocol to wait 3 weeks for a tooth to lose it’s sensitivity? It will help if you have the piece that broke off. An excellent cosmetic dentist will be able to reattach that piece. But I would strongly recommend choosing an expert cosmetic dentist from our list. You didn’t indicate what city in California you are in, or I might have recommended someone. But this is a tricky esthetic situation and you want this tooth to look good and match the other front tooth, and 98% of dentists wouldn’t be able to do that. If you don’t have the piece of tooth to be reattached, I would recommend direct dental bonding as a repair for her broken front tooth, because of the age of your daughter. Then, when she is older and the pulp in the tooth is smaller, it may need a single crown, or more depending on exactly what the damage is on the other front tooth. Assaulted, her front teeth are loose. Will she lose them? I was recently assaulted by my ex-boyfriend, the father of my child. He punched me directly in the mouth. Now both of my front teeth are loose; one is more loose than the other. I went to the e.r. and they took a cat scan. They said that there were NO fractures. I am 26 yrs. old and I am scared to death that I will loose my two front teeth. Is there a good chance that my dentist will be able to save them? Also if they can be saved, what long term effects can this have on me? He also completely ripped the piece of skin that holds my upper lip to my mouth. At the e.r. they said there was “no point in stitching it, some people have that piece of skin and some don’t, if it’s not there it’s not a big deal.” Do you agree with that statement? I’m sorry to hear what happened to you. I feel for you. If the roots of the teeth aren’t fractured, they need to be stabilized in the correct position in the next day or two. Your dentist needs to bond these two teeth into a fixed position, making sure that the position he fixes them into is the correct position, and then the bone will heal and they should be fine. The ER is right that this piece of skin that was ripped is no big deal. It may grow back anyway. Sometimes, because it pulled at the gum tissue, we would try to clip this piece of skin and it would grow back anyway. Long term, again as long as the roots aren’t fractured, you should be able to keep these teeth and everything will be fine. And then I would go back to the dentist after two or three weeks and have him check to see if the nerve of either tooth is damaged. If it is, you’ll need a root canal treatment. If that is the case, tell your dentist not to leave any gutta percha or root canal cement in the crown of the tooth. He or she will understand what that means. Leaving this in the crown of the tooth causes the tooth to go very dark in time. If the gutta percha and cement is removed, it will go dark very very slowly–over a period of years, and you can deal with that much later down the road. Some dentists think that every tooth that has a root canal needs a crown, to strengthen it, but if there are no large fillings in any of these teeth and one or both needs a root canal, I would advise you not to get the crown, because a crown on a very front tooth that is otherwise intact and only has a root canal–a crown in that situation will actually weaken the tooth. And if you need help with any treatment, the American Academy of Cosmetic Dentistry has a program to help victims of domestic violence. If you want help like this, look up the “Give Back a Smile” program of the AACD. You may not need anything until later, if either tooth turns dark. But I’d check out the program and see what you have to do to document that the problem was caused by your ex-boyfriend assaulting you, and be sure that’s in place so you can later take advantage of the program if that comes up. A dead tooth turns dark and can crack. Read about a case where a front tooth broke off because a dentist did crowns on front teeth that had root canal treatments.